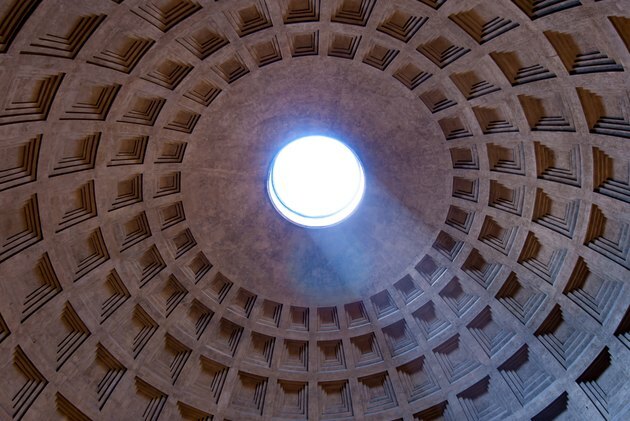 Rome's Pantheon, built in 126 AD, is the world's oldest unreinforced concrete structure. Although it is used everywhere in modern construction, Concrete is by no means a modern invention. The Romans used it to build structures such as the Pantheon, and a 12-million patch of natural concrete was discovered in Israel in the 1960s. Modern concrete mixtures made from Portland cement originated with British bricklayer Joseph Aspdin, who made the first gray cement mixture in his kitchen in the 19th century. Although it took Aspdin to combine the ingredients in the proper proportions, the components of Portland cement are all found in nature. When combined with two other key ingredients, Portland cement creates concrete—a building material used every day in virtually every part of the world. To take advantage of this versatile material, it helps to understand the chemistry that makes it harden and some of the best practices for using it. Keep concrete wet while it's curing to prevent cracking and achieve the maximum hardness. Although variations exist, the three main ingredients in any concrete mixture are Portland cement, water, and an aggregate. When mixed with water, Portland cement forms a binder that holds together the aggregate—composed of sand, gravel or a mixture of the two—in a solid mass with a compressive strength that rivals that of steel. Portland (hydraulic) cement itself comes from naturally occurring minerals that include limestone, sandstone, shale, iron, clay, and fly ash. Manufacturers pour these raw materials into cylindrical concrete kilns and heat them to temperatures as high as 3,000 degrees F. This treatment drives out water and carbon dioxide and forms new compounds collectively called clinker. The clinker is ground into a fine powder to which gypsum is added to control the rate at which it hardens when recombined with water. This powder is what is known as Portland cement. Bags of concrete mix come in different forms for different uses. In standard concrete mix, the aggregate is a mixture of sands and small gravels. So-called "sand mix" is a mixture using finer sands and no larger gravels in the mix. It is good for patching and craft projects calling for concrete. Even finer aggregates are used in mortar mixes, which are used for joining bricks and blocks. Various additives can also be added to concrete to change its properties. For example, anchoring concrete mixes include epoxies to increase their holding power. Fiber-reinforced concrete includes filaments of fiberglass to reduce cracking for applications such as patios and stucco repairs. Additional additives can either quicken or retard the time it takes for the concrete to harden. Use about 3 quarts of water per 80-pound bag of concrete mix. Everyone knows that concrete hardens when you add water. The chemical reaction that occurs is known as hydration, and because the cement contains five different substances that undergo this reaction, the process is a little complicated. Calcium silicates, which comprise 75 percent of the mixture, are the most responsible for hardness. They produce sodium hydroxide and heat as they hydrate, which is why you should always wear gloves when mixing concrete. The pH of wet concrete can rise to 12 or more, which makes the mixture extremely corrosive. Skin burns are common when working with concrete. You need a precise amount of water for complete hydration. If you use less than the recommended amount—about 3 quarts per 80 lb. bag of premix—the concrete won't be sufficiently strong, but using too much water also weakens the mixture. Concrete doesn't have to dry out to harden, which is why you can pour concrete structure underwater. However, as soon as all the hydration reaction is complete, any extra water in the concrete mixture goes into the pores, which weakens the overall structure. Much of this water eventually evaporates, but it can take years for all excess water to evaporate. When mixing concrete, there should be just enough water for it to be pourable and workable, but not enough to make the mixture soupy. 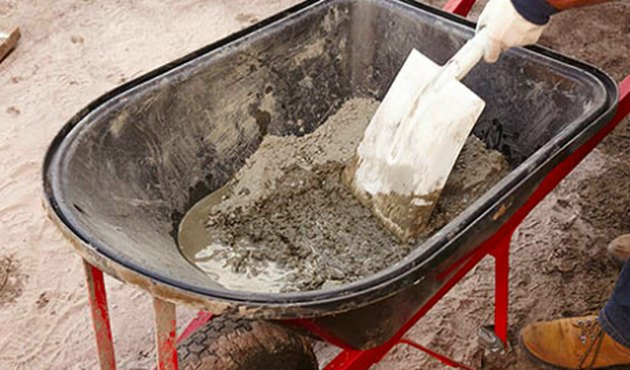 Small amounts of concrete can be mixed in a wheelbarrow or plastic masonry trough, using 60- or 80-pound bags of dried premixed concrete, a garden hose, and a hoe to mix the concrete. For larger quantities, you can rent an electric mixer to mix up bags of concrete mix, or order ready-mix concrete from a vendor who will deliver it in a large mixer truck and pour it on site. 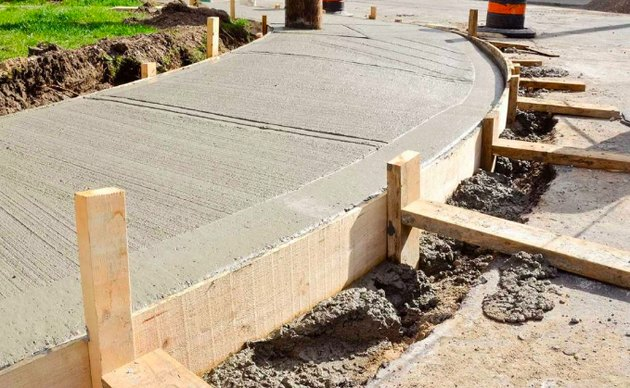 Forming is the most time-consuming part of a concrete installation. Fresh concrete is a basically a highly viscous liquid, and, like any liquid, it will level itself out into a puddle if you don't contain it. Forming slabs and other shapes out of concrete requires that it be contained. The containment process it is called forming, and builders usually do this with dimensioned lumber and plywood. Because forms aren't permanent, you don't construct them for appearance, but they must be constructed to be strong enough to support the weight of the concrete and they can't have any gaps through which the wet concrete could seep. It's important to use smooth plywood when forming a visible surface, such as a wall, because the grain pattern of rough plywood will be permanently imprinted on the hardened concrete. Quality builders often go to the extra trouble of applying tape to the plywood to guarantee a smooth surface when the form is removed. The tape also ensures quick release. It's better to build concrete forms with screws than with nails. Any impacts the fresh concrete experiences when you pull nails to release the forms could crack it. You don't need quality screws for this; many builder use inexpensive drywall screws to build forms. Every concrete project of any size calls for a network of steel reinforcement. 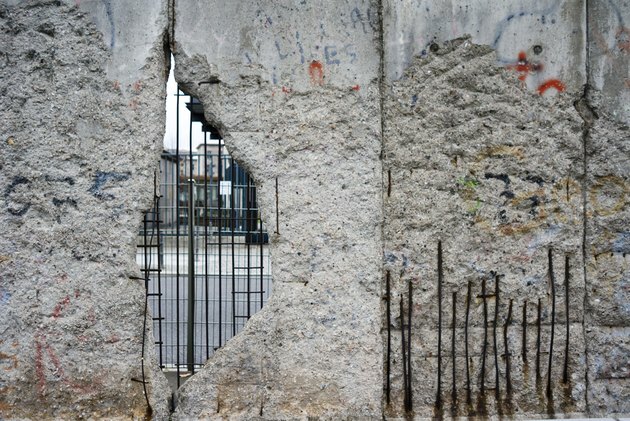 Although concrete has a high compressive strength, its tensile strength is nowhere near that of steel, and structures like slabs and walls can crack under weight. To prevent this, builders incorporate a network of steel reinforcement into every large structure. They usually build a structure of reinforcing bars (rebars) into walls and foundations, or lay a ground cover of reinforcing mesh—called remesh or hard cloth—when pouring slabs. Building the steel reinforcement can be as big a job as building forms. Rebar and remesh come in various diameters, and you choose the diameter based on the tensile strength you need for your project. It's hardly ever a mistake to overdo it. You can bend rebar to create curved shapes using a rented bender, or you can have pieces bent by any dealer who sells concrete supplies. Careful finishing can produce a glassy-smooth surface on new concrete. Depending on the appearance you desire, finishing concrete can be a single- or multi-step process. Typically, the finishing process begins with screeding the surface with a straightedge or trowel while the concrete is still wet. For some applications, such as a utility pad, screeding may be all that is necessary. If you're pouring a patio or basement floor, however, you'll probably want to smooth the surface again when the concrete has stiffened, and when it hardens, you may want to buff it with a polishing machine. The process of smoothing the surface is called floating, and it is a skill that requires considerable experience and craftsmanship. 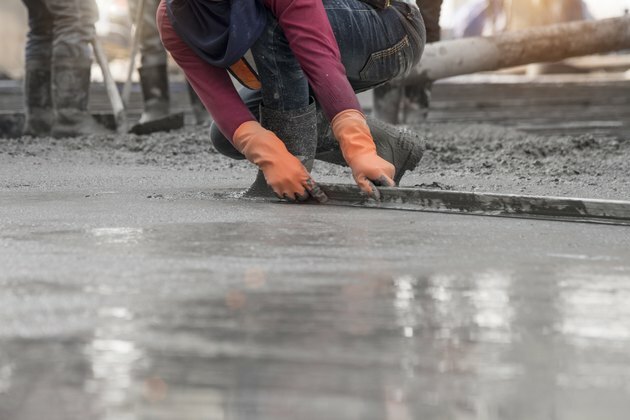 The goal of floating is to lift finer aggregate particles and cement powders to the surface to create a smooth surface, but excessive floating can weaken the concrete and create a surface that will later flake away. It's possible to add colorant to concrete before you pour it, or you can buy concrete that has already been colorized. After the concrete hardens, you can stain it with an acid stain or color it with a dye. Acid stains react with the chemicals in the concrete to produce a number of earthy colors. Use a dye if your tastes run to more vibrant hues. If you use concrete to make an interior feature, such as a countertop or a bathroom floor, you'll need to seal it to prevent dirt from lodging in the pores. 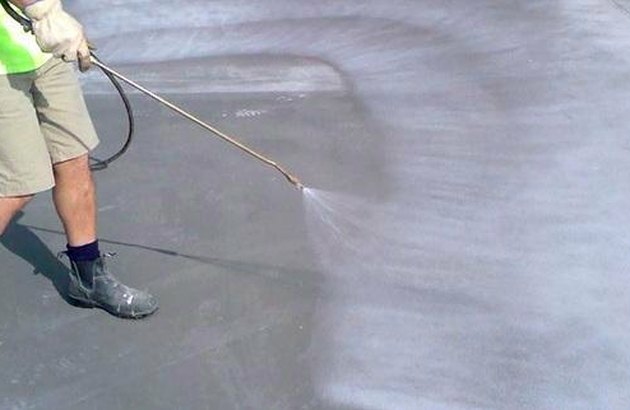 Most concrete sealers consist of polyurethane or acrylic suspended in a solvent—usually water. The concrete should be dry before application, which means waiting for several weeks before sealing a newly poured surface. Spray, brush or roll the sealer on, and wait for it to dry before using the surface. It's a good idea to reseal every few years or so. Before each resealing, thoroughly clean the concrete with soap and water or, if appropriate, with a pressure washer.